Our nation’s future prosperity is shaped in part by the accuracy of the data collected by the United States Census Bureau on the nation’s population, and on its racial, ethnic and national origin groups. These data help ensure fair and representative reapportionment and redistricting, and guide a wide range of decisions made in the public and private sectors that affect the lives of all Americans. Census data also play an indispensable role in the monitoring and implementation of civil rights policies, and they are used to ensure the effective allocation of billions of dollars in federal, state and local funding. Critical resources and new approaches that would be covered in the NALEO Educational Fund supported $1.5 billion funding level include a robust communications campaign; outreach and promotion; language and telephone assistance infrastructures and materials; testing of internet response options; the use of administrative records to reduce non-response follow-up; and innovations in address canvassing. This funding level will also ensure that the Census Bureau can effectively conduct the American Community Survey (ACS), the annual survey that produces data that are critically important to the business, non-profit and public sectors alike. As the nation’s leading nonprofit organization that facilitates the full participation of Latinos in the American political process, from citizenship to public service, NALEO Educational Fund is committed to ensuring that the Census provides the most accurate portrayal possible of the Latino community and the entire population. The letter sent to the leadership of the Subcommittee on Justice, Science and Related Agencies can be found at www.naleo.org/downloads/2015/NALEOCensusFY16fin.pdf. Undocumented immigrants living in Arizona while their deportations are deferred are lawfully residing in the state and therefore eligible to pay in-state tuition to attend state colleges, a judge has ruled. Tuesday's ruling in a case filed against the Maricopa County Community College District may have implications for the state’s roughly 20,000 recipients of deportation relief under President Barack Obama’s Deferred Action for Childhood Arrivals program. DACA, as the policy is known, defers deportation and offers work authorization to many undocumented immigrants who were brought to the country as children. Andiola said activists like her will be watching to see if the Arizona Board of Regents puts the state’s university system on the same path as the colleges. The regents will meet on Thursday at 10 a.m. to discuss how to handle tuition rates for DACA recipients in light of the ruling, board spokeswoman Katie Paquet said. Tom Horne, a former Republican state attorney general, sued Maricopa County Community College District in June 2013, arguing that charging DACA recipients in-state tuition for the district's 10 colleges violated a 2006 law passed by referendumthat prohibits undocumented immigrants from receiving the in-state price, which is considerably cheaper than out-of-state tuition. But the ruling by Maricopa County Superior Court Arthur Anderson says DACA recipients have a right to reside in the state, according to federal law, and Arizona law shouldn’t interfere with that. "I'm very pleased with Judge Anderson's ruling in this important case," Maricopa County Community College District chancellor Rufus Glasper said, according to the Phoenix New Times. "Since our founding, the Maricopa Community Colleges have stood for accessible and affordable education for all members of our community, and this ruling endorses our mission. The real winners in this case are the students of Maricopa County, and each one can continue to count on us to help them fulfill their educational goals." Horne's successor, Attorney General Mark Brnovich (R), said in a statement Tuesday that his office is "reviewing the decision and weighing all legal options including appeal." The attorney general has until June 5 to decide if it will challenge the ruling. RIVERSIDE, Calif. – Latino scholars, community leaders and activists will meet at the University of California, Riverside on Saturday, March 7, to discuss the status of Latinos in the United States. The student-organized conference – “California Forum on the Status of Mexican@s and Latin@s in the U.S.: Empowered or Powerless?” – is scheduled from 8:30 a.m. to 1 p.m. in Materials Science and Engineering Building 0116. The event is free and open to the public, but registration is requested and may be made online. Parking is free. Ethnic Studies professor Armando Navarro said forum speakers will address issues that affect the Latino population, such as poverty, jobs, education, health, immigration policy, the role of Latino voters and why so many did not participate in the 2012 and 2014 elections, the projected role of Latino voters in 2016, and Mexico’s state of crisis. According to the Census Bureau, there are approximately 54 million Hispanics in the United States, about 17 percent of the total population. The Hispanic population is expected to double in size by 2050. In California, nearly 40 percent of the population is Latino. Despite the numbers, Latinos are not represented proportionally when it comes to holding public office, graduation from college, or income, Navarro said. “This is intended to be an educational forum examining the present status of Latinos today and where we go from here,” he said. The forum is organized by students in Navarro’s undergraduate course “Chicano Politics in Comparative Perspective.” The students, who call themselves the Alliance for Change Today, formed committees that collaborated on event details from choosing the theme and identifying speakers to handling publicity and arranging the facilities. The forum will begin with keynote speaker Isabel Garcia, an attorney and executive director of Coalición de Derechos Humanos, discussing the impact of President Obama’s executive orders that would defer the deportations of millions of undocumented immigrants. Coalición de Derechos Humanos is a grassroots organization based in Tucson, Ariz., that promotes human and civil rights for all migrants. Navarro, a political scientist and longtime professor of ethnic studies at UC Riverside, will address details of his new book, “Mexicano and Latino Politics: The Quest for Self-Determination – What Needs to be Done.” He is the author of numerous articles, book chapters, monographs, and reports on Chicano/Latino politics, Chicano political history, redistricting, community organizing, social movements, immigration, and education. This week the House of Representatives is scheduled to vote on H.R. 5, the "Student Success Act." This bill would reauthorize the No Child Left Behind (NCLB) law, which in turn reauthorized the venerable Elementary and Secondary Education Act of 1965. But its rosy name notwithstanding, H.R. 5 would do little to help Latino students succeed. Instead, the bill would significantly undermine the gains made by Latino students since NCLB was implemented in 2002. H.R. 5 would weaken accountability measures, potentially end annual student assessments, and significantly erode the gains made by Latino students since the reforms of NCLB began to level the educational playing field. Though No Child Left Behind is hardly a perfect initiative, the law has done substantial work in improving the math and reading scores of Latino students over the past ten years. NCLB's central tenet that no student should slip through the cracks plays out in three broad practices: annual testing of students in math and language arts; performance targets; and subgroup accountability. The widespread adoption of these practices over the past ten years holds significant civil-rights implications for the Latino population. Consider, for instance, the third piece of the NCLB trio: subgroup accountability. When Latino student performance is tracked distinctly (prior to NCLB, performance was recorded as part of a formless, unhelpful aggregate) parents, advocates, and public servants are able to learn exactly who is flourishing and who is not. Subgroup accountability means that education advocates have been able to push school districts who fail to educate their Latino students, as is too often the case, and this pressure has led to increased performance among Hispanic youth. Latinos cannot afford to abandon this badly-needed reform when inequities still run rampant throughout our education system. After all, despite the past decade's gains in Latino math and reading scores, Hispanic Americans still lag far behind all other ethnic groups when it comes to educational achievement. Only 13.1% of Latinos aged 25-29 had completed a bachelor's degree or higher in 2012, for instance, while 17.8% of Blacks, 31.1% of Whites, and 50.4% of Asian Americans held that credential. This is occurring in an economy where by 2018, experts forecast that 63% of jobs will require at least a college degree. Meanwhile, 30% of our K-12 students will be Hispanic by 2023, and 20% of American workers will be Latino by 2020. What this will all add up to, if things don't change, is an under-educated population that will not be able to find work in a 21st-century economy. Our educational policy cannot abandon Latinos to under-education and subsequent underemployment - yet this is precisely the track Congress seems to be putting Latino students on. 4)	Enabling school districts to subsidize affluent, suburban schools with money intended for needy schools that need it most. Clearly, none of these proposals would do anything for Latino students who remain under-served and under-educated in a rapidly-changing economy. At a time when stark achievement gaps between subgroups of students remain unresolved, when increased funding in education is more badly-needed than ever, and when too many schools are too often seeking to exempt English Language Learners from their accountability systems, H.R. 5 threatens to exacerbate the educational inequities that have long held back Latino students in our schools, and that have held back Latino graduates in the workforce. 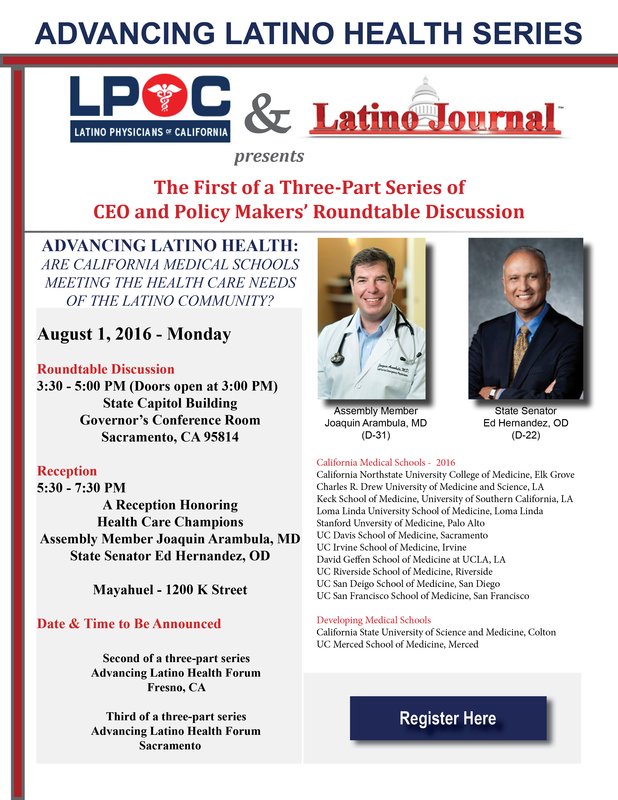 Latino Journal collaborates with Latino Physicians of California to convene a three-part series "Advancing Latino Health: Are California Medical Schools Meeting the Healthcare Needs of the Latino Community?"